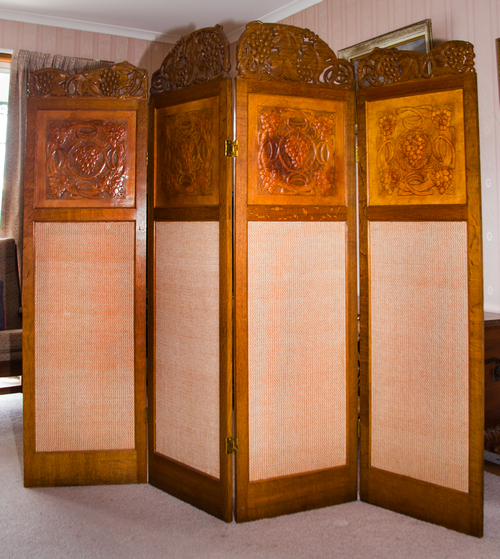 "The Seasons" four panelled screen carved 1906 . Who was Nellie Payne? “The Seasons” four panelled screen. Close up Briar Rose embroidery. One piece which all members of the family were proud to point out to visitors was the finely wrought four-fold screen which had quickly become a familiar adornment of the sitting room at 320 Elizabeth Street. It had been created before the family left England, and was a constant object of admiration, for it was particularly beautiful piece, comprising fine carving, clever leather work, and exquisite needlework. 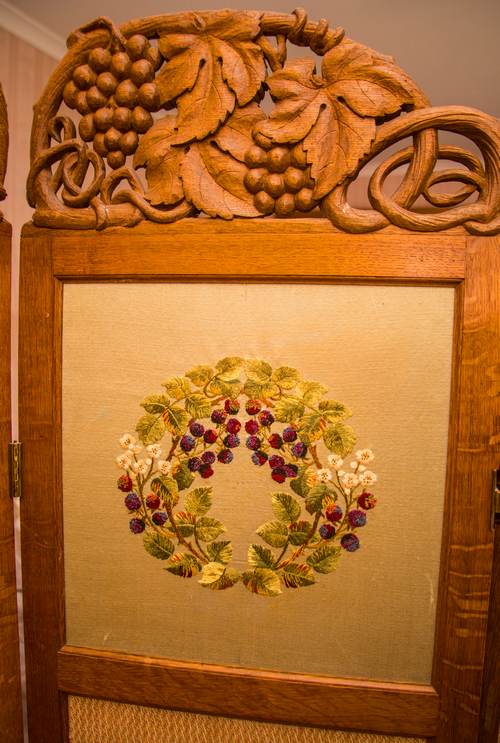 The four lower, longer panels of this screen consisted of green arras cloth contained within a plain oaken frame. 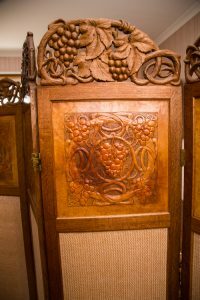 The upper square panels were, on one side, of leather cleverly embossed in a grapevine design dyed brown and orange. 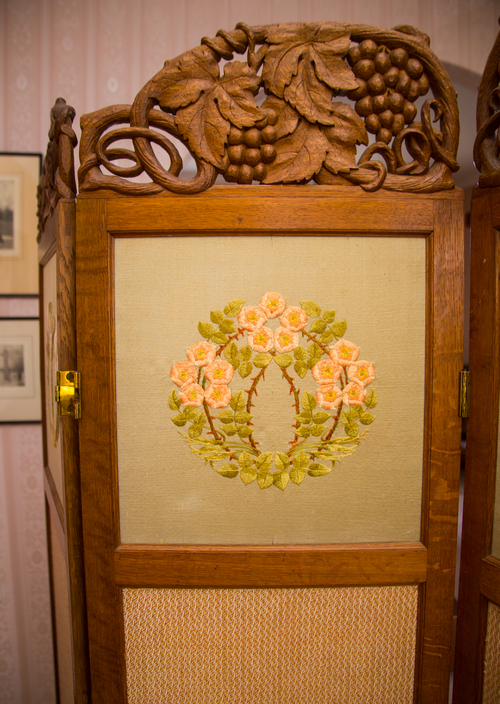 Into the reverse sides of these panels Mrs. Payne had put some of her finest needlework. 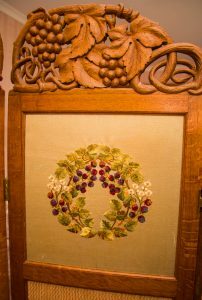 On blue satin bases she had worked conventional designs or motifs representing the four Seasons – purple crocus for Spring, briar rose for Summer, blackberry for Autumn, and mistletoe for Winter. Over all was a headpiece of pierced carving in a grapevine design matching the embossed leather panels. The screen stood about five feet six inches high. In England, this screen, which had been completed in 1906, had been greatly admired by members of the Arts and Crafts Society of London, and the society had done its best to prevail upon her to leave it behind when she sailed for Tasmania so that it might be shown at the society’s forthcoming exhibition. But Mrs. Payne had put so much of herself into the making of it, and so much thought into the designing of it, that she could not bear to part with it. 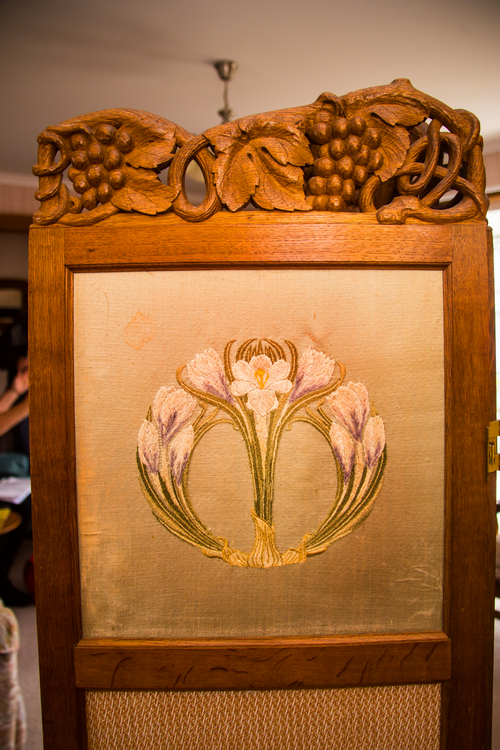 She brought it with her, and in 1974 it was still standing in the corner of the sitting room of the Payne residence in Hobart, its lovely silken panels just a little faded, its leather panels in need of some renovation, but still a distinguished creation by a skilful and imaginative artist.